CAPTAIN MARVEL AND HER WAR AVENGERS HOLD THE FRONTLINE! 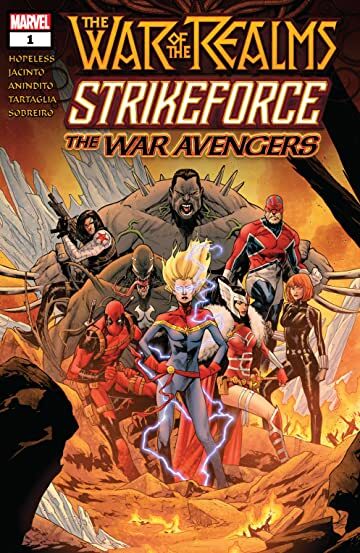 While two other Strikeforce teams head out to other realms, Captain Marvel leads the fight to reclaim the Earth! But even with a crew of heavy hitters (Weapon H, Captain Britain, Venom, Deadpool) and two of the best spies on the planet (the Winter Soldier and the Black Widow), Carol’s fighting a losing game. Malekith’s allies are without number — and the battlefield bigger than any Carol’s commanded before. Time to lay it all out on the line — and fight for a miracle.